The more you learn about animals, the more you realize that they are just like us. We may walk upright and drive fancy cars, but at our core we want the same things that they do. To protect the ones we love, and to be protected and loved in return. 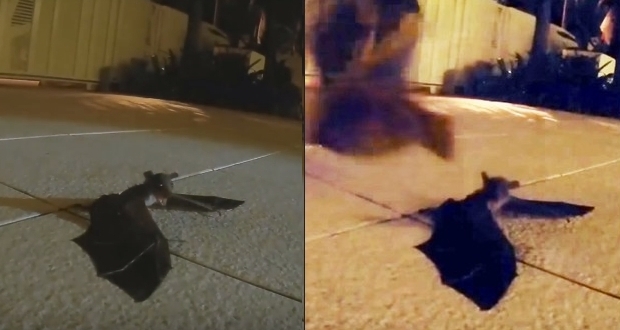 Animals bond with their children just the same as we do, which is what makes this video of a mommy fruit bat being reunited with her baby so darn moving! The baby fruit bat was found stranded just two hours before by a concerned animal lover who contacted the ACRES (Animal Concerns Research & Education Society) Wildlife Rescue Team for help. The whereabouts of the baby’s mother were unknown, but the rescue team knew that if she was out there, she would return to the place where her baby went missing. The team diligently gathered the baby bat and returned him to the initial location to wait for mama. In no time at all, the mama bat picked up on her baby’s calls and sprung into action to find him. After she found him, she quickly got him back into the skies and probably gave him tons of bat kisses on the way home! Responses to "Heartwarming Reunion Of A Lost Baby Bat With His Mother"
Thank God there are still people like this in the world who care about animals. I love this little film. I have some bat houses on trees on my hillside. Placed baby where mom could reach .